Welcome to the fourth installment of "Tips From the Grading Room." Last issue, we took a look at what constituted a "Full Steps" Jefferson Nickel, designated "FS" by PCGS. This time, we'll examine the "Full Bell Line" designation for Franklin Halves. 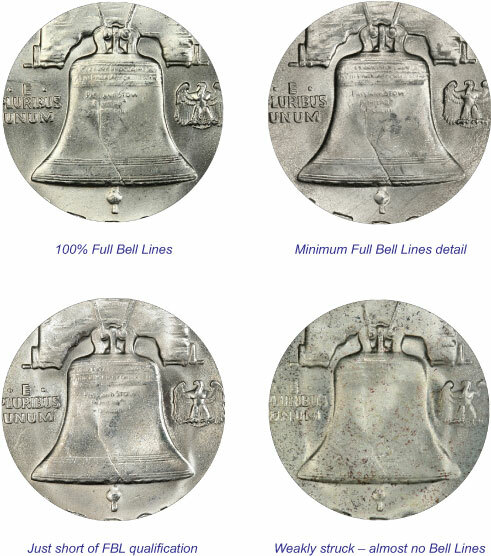 When the bottom set of lines across the Liberty Bell is complete and uninterrupted, a regular-strike Mint State 60 or above Franklin Half Dollar receives the designation Full Bell Lines (FBL). If these lines are obscured by marks, strike, planchet defects, or other problems, the coin will not receive the FBL designation. A few marks across the lines will not prevent a coin from receiving this designation, as long as the continuity of the lines is not disturbed. Multiple marks, scratches, scrapes, or other detractions that interfere with the continuity of the lines will prevent a specimen from receiving the FBL designation. Slight incompleteness of the bell lines, immediately to the left or right of the crack that traverses the bell, will not prevent a coin from receiving the FBL designation. Premiums for some dates, such as some of the San Francisco issues, may be multiples of the non-FBL coins. The following four photographs show a coin with 100% Full Bell Lines, then one with the minimum requirements for Full Bell Lines, followed by a coin that falls just short of the threshold for Full Bell Lines. Finally, we show an example with almost no visible Bell Lines; a very weak strike.